If not for our ST, a lucky bounce for an INT and a late sack/Fumble/TD, Mo's performance could have cost us the game last night. If not for our ishy secondary last year, the Giants would have been sitting at home instead of winning the Lombardi. Yeah.... Miles Austin not driving to the ball on that 3rd down in the 4th quarter had nothing to do with that loss. Nothing at all. And the only reason the ball was thrown so far out was becasue the PRESSURE was in Romo's face due to an inept O line! And as for the defense, no pressure on Eli = Loss for us. Even with a good secondary we still probably lose that one. Manning Last year: 746 yards, 5tds and 1 int in two games. Manning this year: 405 total yards, 1 td and 1 INT in two games. Way too much credit since they have not hit on a draft pick after the 4th round in a while. I really wish people would stop stretching the bounds of reality to prove their point. I don't think he's stretched it all that far...Lissemore ['10], Scandrick['08], Phillips['09] and Butler['09]...Anyone else have any significant contributions? Oh...Harris['11] made an impact yesterday. "Have not hit" ..."in a while." Implies that we have had 0 production in an extended period of time. Which is untrue. As you were able to point out. You CAN claim that not every pick has been successful. Which most rational individuals could understand since the draft itself is a crap shot (for those of you who don't believe me, look up Jimmy's drafts. He didn't always hit on a pick). But you cannot say we have not hit. That's false. 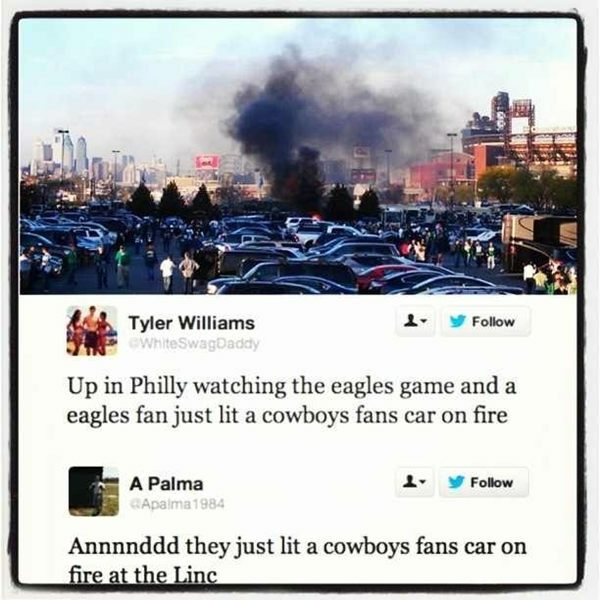 To be fair it was leftover burning charcoals that supposedly started it by accident, also I have not seen confirmation it was a cowboys fan's car. If its true at least we don't/didn't pull a San Francisco. I still think there is a conspiracy that all the sudden the Niners and Giants (MLB) are good....both leagues rigged it so San Fran fans stopped stabbing people, etc after losses every week. What a bunch of lunatics. You calling whiteswagdaddy a liar? Personally, I'd never question the integrity of whiteswagdaddy. He's a credible source if there ever was one. And I'm not just saying that cause I drive a $45,000 car. We're listing a backup/3rd string TE and a rotational pass rusher but not a guy who started at S? Was he bad? Yes... but he was better than Phillips IMO and better than Harris who were listed. All bold print was written by me, RTNLDAVE. If you are going to have the stupidity to take bits and pieces of written material and use it to try to validate your points, at least have the common sense and decency to include the context in which it was written. I also seem to remember writing something to the effect of: "I'm not sure if I am calling this a fix because I am trying to protect my ego as a Cowboys fan and not endure the pain of them losing to such a terrible team OR if I am trying to protect my intelligence as an educated man and say this can't be for real, no team is this stupid." Yeah, didn't see you post that you jackarse! There's ol rational dave at his best..... I was laughing at you... and others while reading the GDT. That's why I included your posts. As for the name calling? I'll leave that to you. You see, that is exactly my point. If not for our ST, a lucky bounce for an INT and a late sack/Fumble/TD, Mo's performance could have cost us the game last night. Given the history of people's posts on this site in the past after a loss, I sincerely doubt everyone would be as forgiving today. If it weren't for the uniforms, the location, the completely different roster and staff, the Cowboys would be the Eagles. If it weren't for the bed, the engine, and the size, my truck would be a car. If Romo would have thrown 5 ints, feilx would have fumbled, and Dez would have slapped a ref they would have cost us the game. So I guess we agree Dave. If things would have been different, then things would have been different. Very rational of you sir. Going into the draft, the team had recently signed Bernadeau and Livings. In 2011, they spent picks on Arkin and Nagy and brought in Kowalski and Costa. Now, as we all know, you can find successful lineman in the later rounds of the draft. I believe the hope was to have Livings start at LG and let Arkin and Nagy compete with Bernadeau for the starting RG job. Unfortunately, we had Costa and Kowalski both go down with injury as did Nagy and Bernadeau. That really put a strain on our depth. Arkin was forced to start at center and thus derail his development and ability to focus on his more natural position: OG. You can not plan for injuries, plain and simple and hindsight is 20/20. Who's to say how things would have turned out on the OL had basically four out of five potential players on the OL got injured. So what has Arkin, Nagy, Kowalski shown us but glimpses of having a clue during the game. You give this scouting dept. Way too much credit since they have not hit on a draft pick after the 4th round in a while. Claiborne will be a good player, but the arguement is more about giving up picks to move up to get him rather than whether he was a good player or not. I too would have liked to pick up a few offensive lineman early in the draft, but at the same time, it is ridiculous to criticize a pick that has looked very good and was widely considered to be the best defender in the draft. When you get the opportunity to draft a true play-maker at a key position, you do so. This defense was lacking in both quality CB's and players that could make a big play - taking a chance on Claiborne was well worth it. Moreover, we have seen many times what happens when Jerry moves down and gets cute with his selections. I will never fault a decision to take a chance to land a great player, regardless of position. For the first time this year, Claiborne did not play well. It happens, especially to rookie CB's. But I love what I have seen from him so far. He has an attitude and cockiness that has been sorely lacking from this defense for a long, long time.